The applications are said to still be early in development, but they are being considered for release later in the year. It is currently uncertain, but still possible, if the new pieces of software will be ready to ship with the upcoming iOS 8. Instead of using fully functional Preview and TextEdit applications on iOS, users will be encouraged to use the PDF management and editing functionality in the free iBooks application from the App Store and manage other documents via the iWork suite’s word processing application Pages. The apps will also bring improved feature parity between the two Apple operating systems. The development of the new applications comes as a benefit of Apple Senior VP of Software Engineering Craig Federighi’s restructuring of Apple’s OS X and iOS development teams over the course of the past year, according to sources. These people say that Federighi has opened the previous iOS and OS X feature development silos and that all iOS and OS X software engineers work in tandem on both operating systems. 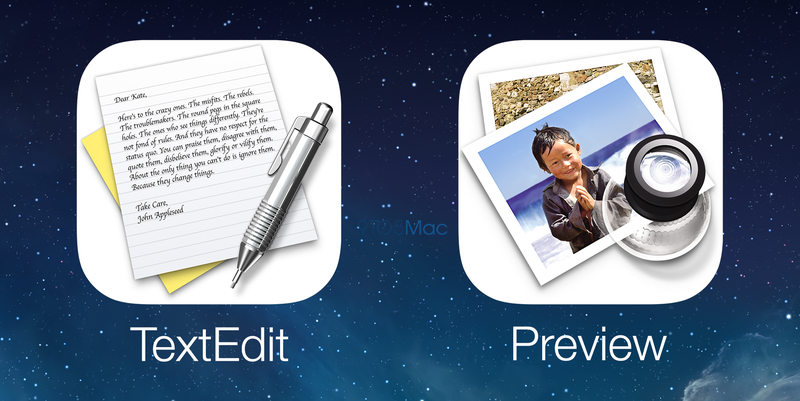 Prior to these changes, for example, an OS X team would develop the TextEdit and Preview apps completely separately from the larger iOS group, who could, independently, develop versions of Preview and TextEdit for iOS. Now each application is managed by single groups that develop both iOS and OS X versions. In addition to working on new iCloud applications, Apple is said to be researching new iCloud storage tools to make the development of server-integrated App Store applications for iOS simpler. Developers have long complained that building App Store apps that rely on iCloud is a complex and unreliable process. This potential future initiative would be designed to resolve those issues. The future developer tools, which have been tabled by Apple engineers in the past, may never ship. However, Apple’s research in that Parse/Facebook and Amazon-dominated space is nonetheless intriguing. If launched, Apple’s new iCloud development tools would allow developers to further take advantage of Apple’s vision of the future of software file systems. In addition to new iCloud functionality, Apple is actively developing a standalone iTunes Radio app, new Maps app, and Healthbook activity tracking software for the next version of iOS.